Building High Self Esteem - What is your relationship with yourself? The basis for building high self esteem is the relationship with yourself. How you feel and treat yourself is where you start when you want to build high self esteem. Answering these questions, will provide you with a reflection of your relationship with yourself. Are you accepting or critically judgmental? Are you forgiving or your bonded to old resentments? Do you take responsibility for your experience or do you blame others? 1. Make a list of the thoughts, feelings, words and actions that nourish a loving relationship with yourself. 2. When you notice you are being critical, unforgiving and unloving toward yourself - use your list to re-direct your thoughts, words and actions. 3. What do you notice about your feelings when you are more loving toward yourself? Just as a muscle requires regular exercise to maintain it's strength and flexibility building high self esteem requires consistent regular practice. We recommend that you take time everyday to practice this activity until it is firmly planted in your mind. Building High Self Esteem Lesson Plan and the many other self esteem building activites on this page. Is Low Self-Esteem Keeping You from Achieving Your Hopes, Dreams & Goals, or Making You Feel Inferior, Unimportant And Unworthy? It Doesn't Have To Be That Way Anymore! Our FREE Self Esteem Exercises will help you Learn How You Can Build And Restore Your Value And Worth Through this Amazing Easy To Follow Report. We can show you how to Love Your Self! It is easy to read and will help you change how you feel about yourself! Sign up for our mailing list today and we will give you instant access free of charge. What are you waiting for? 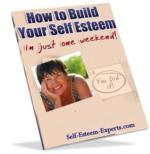 Start building high self esteem NOW! There’s nothing to lose and everything to gain!